From 1992 until his retirement in 2017, the Rev. 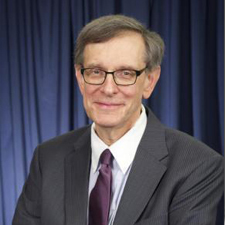 Barry W. Lynn served as executive director of Americans United for Separation of Church and State, a Washington, D.C.-based organization dedicated to the preservation of the Constitution’s religious liberty provisions. In addition to his work as a long-time activist and lawyer in the civil liberties field, Lynn is an ordained minister in the United Church of Christ, offering him a unique perspective on church-state issues. Lynn began his professional career working at the national office of the United Church of Christ, including a two-year stint as legislative counsel for the Church’s Office of Church in Society in Washington, D.C. From 1984 to 1991 he was legislative counsel for the Washington office of the American Civil Liberties Union. In 2006, Lynn authored Piety & Politics: The Right-Wing Assault On Religious Freedom (Harmony Books). In 2008 he coauthored (with C. Welton Gaddy) First Freedom First: A Citizen’s Guide to Protecting Religious Liberty and the Separation of Church and State (Beacon Press). His latest book is God & Government: Twenty-Five Years of Fighting for Equality, Secularism, and Freedom Of Conscience (Prometheus Books), published in 2015. Lynn writes frequently on religious liberty issues, and has had essays published in outlets such as USA Today, The Los Angeles Times, The Wall Street Journal and The Nation. Lynn also has op-eds published frequently by the McClatchy and Scripps-Howard newspaper chains. A member of the Washington, D.C. and U.S. Supreme Court bar, Lynn earned his law degree from Georgetown University Law Center in 1978. In addition, he received his theology degree from Boston University School of Theology in 1973. Lynn is the winner of many national awards, including the Freedom of Worship Award from the Roosevelt Institute, the Puffin/Nation Foundation’s Creative Citizenship Award, the American Humanist Association’s Religious Liberty Award and an award from the Hugh H. Hefner Foundation for his work to protect freedom of speech. Lynn, who was born in Harrisburg, Pa., and raised in Bethlehem, Pa., lives in Chevy Chase, Md., with his family.